Prodrive Racing Australia (PRA) has confirmed the graduation of Cameron Waters to its V8 Supercars Championship driver lineup for 2016, where the reigning Dunlop Series champion will be backed by leading energy drink brand Monster Energy. Waters will drive the No. 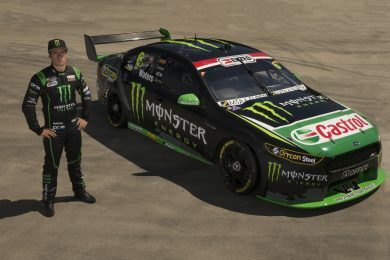 6 Monster Energy PRA Ford in his maiden season in V8 Supercars’ top tier, sharing the garage with 2015 champion Mark Winterbottom — who also gains support from Monster for the 2016 season. Alongside title partner Monster Energy under the Monster Energy Racing banner, Waters will also be supported by long-time sponsor ENZED, established PRA partners Castrol and Orrcon Steel, and new team partner A1 Office. The 21-year-old is eager to get racing and build on his experience after claiming his and theteam’s maiden Dunlop Series title in 2015. “It is really cool to confirm my plans for this season and to have Monster Energy come on board is amazing, I am really honoured such a big global supporter of motorsport is joining the team,” Waters said. “They are a super-cool brand and the opportunities we are going to have this year are pretty awesome. We’re going to have some fun and I look forward to meeting other Monster Energy athletes from around the world. Scott Tabe-Lewis, Monster Energy’s Oceania Marketing Director, welcomed Waters to the Monster athlete family. Prodrive Racing CEO and Team Principal Tim Edwards welcomed the support of the energy drink giant. Waters will debut his new Monster Energy FG X Falcon at the 2016 V8 Supercars season-opening Clipsal 500 Adelaide, March 5-7.